Qualtrics allows for the development of multiple versions and randomly allocate the versions to different sample groups. It is also possible to randomize the order in which the questions are presented. The program provides data files without requiring any encoding, as well some basic statistical analyses. 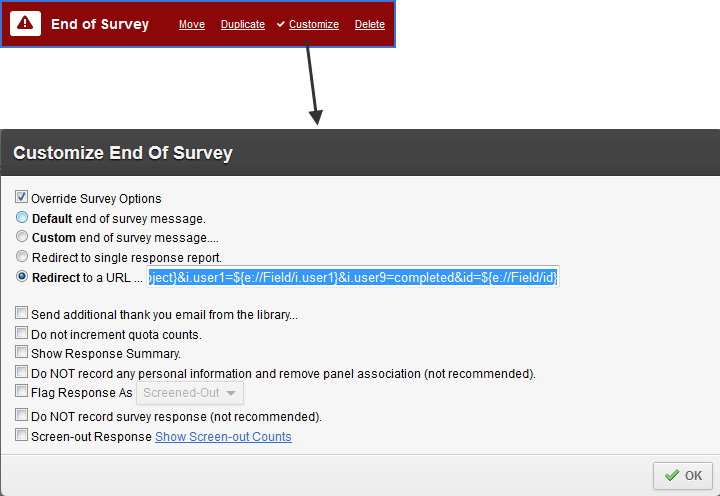 Once on the Qualtrics platform select ‘Edit Survey’ and choose the survey you wish to edit. Next, enter the ‘Service Flow’ and add a new element from the ‘Embedded Data’ group. Note: the placement of this element makes no difference however we suggest pacing it at the top of the list. Similar to the prior stage, in the appropriate locations create the ‘End Pages’ within the survey, ‘Complete’ at end of the survey, ‘Full Quota’ and ‘Screened’ where required. For each of the ‘end pages’ select customize. In the window that opens mark ‘Override Survey Options’ and insert the appropriate link under the ‘Redirect to a URL’ section.